Studio Ghibli is one of the most beloved animation studios in the world, crafting beautiful films with powerful messages about growing up, the environment, war, love, loss and much more. The studio was founded in June 1985 by directors Hayao Miyazaki and Isao Takahata, as well as producer Toshio Suzuki and publisher Yasuyoshi Tokuma. Although Suzuki and Takahata both play a huge role in Studio Ghibli, Miyazaki is responsible for a majority of the studio’s output. Famous for his incredible work ethic, Miyazaki writes, draws and directs most of his films. He is rightly considered a genius in his native Japan and increasingly in the Western world too. Studio Ghibli’s films are some of the most beautiful in existence. The majority of them are animated entirely by hand, with CGI added to enhance rather than create. Ghibli has won a lot of praise for their mature yet accessible take on animation too, balancing heavy themes with family friendly entertainment (for the most part). It’s no surprise that Pixar are hugely influenced by the films of Ghibli. Here are five Studio Ghibli films to get you started, although we’d recommend watching them all! Spirited Away is widely considered the best Studio Ghibli movie of them all, with director Hayao Miyazaki operating at the top of his game. The film follows 10 year old Chihiro, who is moving home with her parents. On the way, they’re transported into a mysterious world populated by spirits and gods. Her parents are transformed into pigs and Chihiro is forced to work in a bathhouse, where she tries to figure out how to escape the spirit world. It’s a fairytale about growing up, a coming of age story told through a fantasy adventure. Like a lot of Studio Ghibli films, there is a strong environmental theme running throughout too. Spirited Away was released to huge critical acclaim, becoming the highest grossing movie in Japan ever. It was also widely praised in the West, becoming the first anime to win an Academy Award. Adapted from a novel by British writer Diana Wynne Jones, Howl’s Moving Castle is a tale about an unconfident young girl who is transformed into a 90 year old woman by a witch. She sets off to find a wizard named Howl, who could cure her (and who saves her from some soldiers). At the same time, her country is being routinely bombed by an oppressive force. Howl’s Moving Castle is a story about finding yourself, acceptance and love, with a strong female protagonist (another common Studio Ghibli trait). It’s also an anti-war movie, a sentiment apparently sparked by Miyazaki’s opposition to the Iraq War. 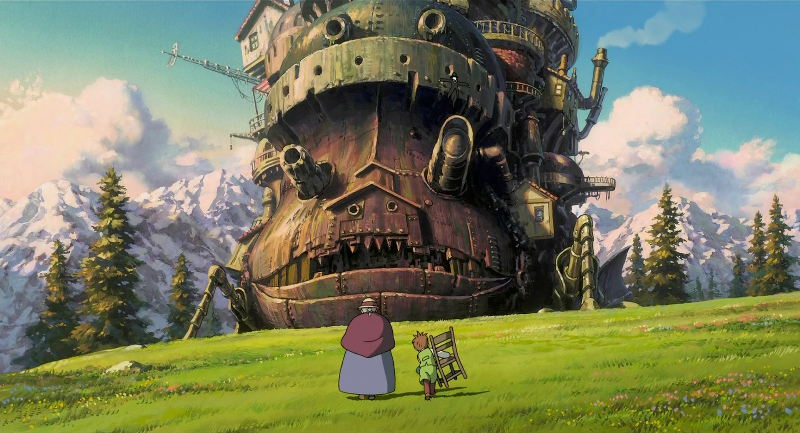 Howl’s Moving Castle was nominated for an Academy Award and remains a favourite among critics despite not winning. You might notice a few familiar voices on the English dub too: Christian Bale voices Howl, while Emily Mortimer voices Sophie. One of the earliest Studio Ghibli films, My Neighbor Totoro is the story of two young girls who move to a new home when their mother becomes ill. Once there, they meet a race of fuzzy forest creatures called Totoros, who take them on adventures and help them understand life. Although it’s a children’s movie, My Neighbor Totoro is surprisingly deep, with loss a particularly big theme. It’s uplifting too though, and the two sisters are among the best Ghibli characters around. And then there’s Totoro. He’s become one of the most popular animated characters in Japan, a Ghibli equivalent of Mickey Mouse. He’s even on their logo! Kiki’s Delivery Service is a more light-hearted Ghibli movie in which an apprentice witch travels to a European seaside town and starts a parcel delivery service. Unfortunately, things don’t go that well. Like most of Miyazaki’s movies, Kiki’s Delivery Service is a lot more profound than it sounds. It explores how people find their calling in life, and how to pursue your passions and find your purpose. It’s a moving, positive tale that most kids (and grown ups, to be honest) will love. Despite the name, Princess Mononoke is one of Studio Ghibli’s more mature movies. It’s set during a war between forest gods and humans who use up nature’s resources. That sounds like a set up for a tired lecture on environmentalism, but Miyazaki handles it wonderfully. He doesn’t present either side as right or wrong; there are no ‘bad guys’ or ‘heroes’. It’s a complex take on a complex issue, which just happens to double up as a hugely entertaining movie too. The main plot follows a prince who is cursed by demon and travels into the forest to find a cure. If you’re a fan of big fantasy adventure movies like Lord of the Rings, you’ll find plenty to love here. Like most of Studio Ghibli’s work, Princess Mononoke received a lot of praise from critics. It was the first animated movie to win Picture of the Year at the Japanese Academy Awards, and also went on to become the highest grossing movie of all time in Japan (it was later beaten by Titanic, which in turn was beaten by Spirited Away). Ready to start your Studio Ghibli adventure? Click below to check out our Studio Ghibli collection on the musicMagpie Store, which features all of the movies in this post and much, much more – including Porco Rosso, Ponyo and Arrietty.